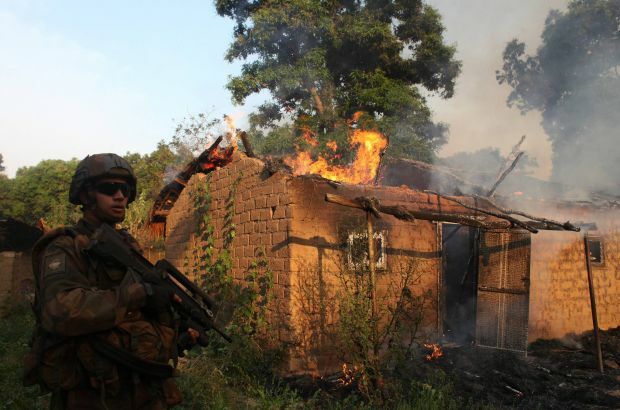 OXFORD, England (CNS) — Catholic bishops in the Central African Republic criticized media portrayals of their country’s conflict as religious in nature and listed preconditions for restoring peace and effective governance. “Our present behavior totally discredits the values of unity, dignity and work on which our Central African nation is founded,” the 10-member bishops’ conference said in a Jan. 8 pastoral message. “We are offering a deplorable image of both ourselves and our country, as we destroy the few infrastructures still remaining to us. The record is appalling,” they said. They added that clashes between the rebel Seleka alliance, which seized power in March, and a northern-based movement, Anti-Balaka, loyal to ousted President Francois Bozize, had provoked “a cycle of reprisals and counter-reprisals,” but said it was wrong to portray the conflict as pitting Muslims against Christians. “Not all Anti-Balaka are Christians, and not all Christians are Anti-Balaka — it is the same with Seleka and Muslims,” the bishops said. “The imprecise terminology which turns Anti-Balaka into a Christian militia must be corrected. This amalgam, propagated by the national and international media, gives a confessional slant to a conflict which is, above all, political and military,” the bishops said. Central African Republic, population 4.4 million, is about 85 percent Christian and 12 percent Muslim. French paratroopers arrived Dec. 8 under a U.N. mandate to help disarm Seleka and Anti-Balaka militants, after fighting in the capital, Bangui, left approximately 1,000 dead. The United Nations said Jan. 7 the country is “on the brink of catastrophe,” with 2.2 million people needing assistance and half of Bangui’s inhabitants, or 513,000 people, forced to flee their homes. In their message, the bishops said they were grateful to French and African peacekeepers attempting, “at the cost of their lives,” to re-establish security and public order. “Everyone must share responsibility in this crisis, which has thrown our country into chaos and turned us against each other,” said the message, co-signed by the bishops’ conference president, Archbishop Dieudonne Nzapalainga of Bangui, and vice president, Bishop Nestor-Desire Nongo Aziagbia of Bossangoa. “The government must also assume its responsibilities before the nation and history. One cannot rule a people with trickery, manipulation and lying,” the bishops added. As conditions for peace, they said the mercenaries should be demobilized and repatriated, and a national army should be re-established to protect the country’s territory and personal security. They added that elections should also be organized quickly, with an independent international commission set up to investigate human rights violations. All factions should be disarmed, the bishops said, and dialogue promoted among adherents of all religious faiths. On Jan. 7, Archbishop Nzapalainga was one of several Christian and Muslim leaders from Central African Republic who participated in a conference call hosted by Rashad Hussain, U.S. special envoy to the Organization of Islamic Cooperation. U.S. religious leaders also participated. A State Department statement said both sides agreed to continue the discussion, to work together to increase education and training on reconciliation and peacebuilding and to seek opportunities to support the travel of religious leaders to Central African Republic. “The religious leaders in Bangui sincerely appreciated the statement that they are not alone and that we here are following their plight and will continue to express our solidarity as much as possible,” he told Catholic News Service Jan. 8.